Johnsonville is recalling raw ground frozen pork patties that were produced and packaged on Sept. 27, 2018, Oct. 17, 2018 and Oct. 18, 2018. 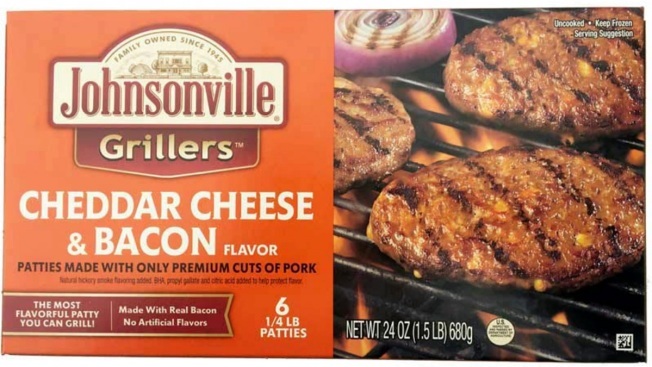 Johnsonville LLC has recalled more than 48,000 pounds of raw ground frozen pork patties that may be contaminated with materials including black rubber. The U.S. Department of Agriculture's Food Safety and Inspection Service announced the recall Friday by the company based in Sheboygan Falls, Wisconsin. Some of the products may be in consumers’ freezers. Consumers who have purchased these products are urged not to consume them. These products should be thrown away or returned to the place of purchase. Consumers with questions about the recall can contact Johnsonville Consumer Relations at 888-556-2728.